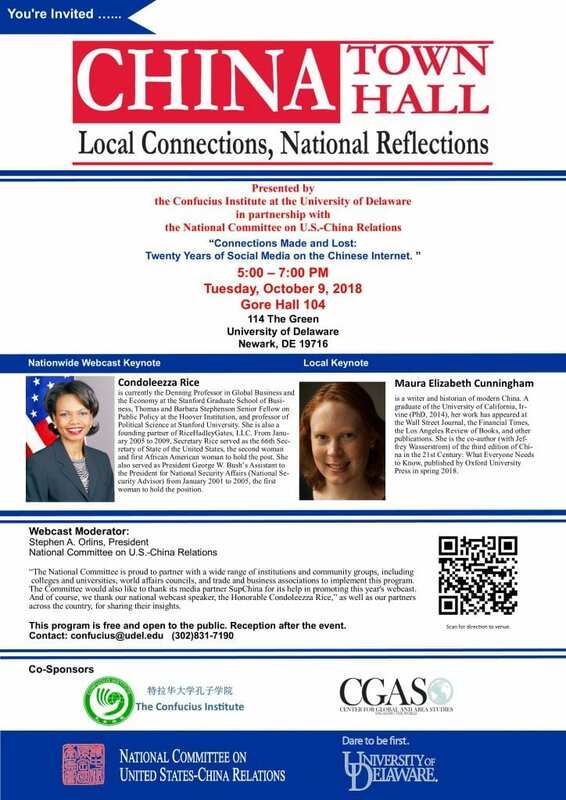 The Confucius Institute at the University of Delaware is in partnership with the National Committee on United-States-China Relations as one of the co-sponsors to present the 2018 China Town Hall program. Condoleezza Rice is currently the Denning Professor in Global Business and the Economy at the Stanford Graduate School of Business, Thomas and Barbara Stephenson Senior Fellow on Public Policy at the Hoover Institution, and professor of Political Science at Stanford University. She is also a founding partner of RiceHadleyGates, LLC. 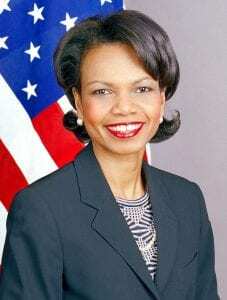 From January 2005 to 2009, Secretary Rice served as the 66th Secretary of State of the United States, the second woman and first African American woman to hold the post. She also served as President George W. Bush’s Assistant to the President for National Security Affairs (National Security Advisor) from January 2001 to 2005, the first woman to hold the position. Read Secretary Rice’s full bio. The CHINA Town Hall webcast will be organized by the National Committee and livestreamed at https://www.ncuscr.org/CTH at 6:00pm on Oct. 9. Dr. Cunningham is a writer and historian of modern China. 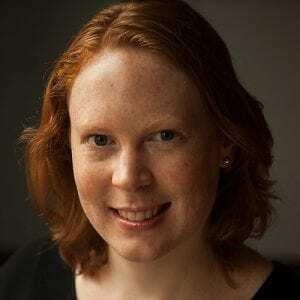 A graduate of the University of California, Irvine (PhD, 2014), her work has appeared at the Wall Street Journal, the Financial Times, the Los Angeles Review of Books, and other publications. She is the co-author (with Jeffrey Wasserstrom) of the third edition of China in the 21st Century: What Everyone Needs to Know, published by Oxford University Press in spring 2018. Read about Dr. Cunningham. The theme title of Dr. Cunningham’s talk is “Connections Made and Lost: Twenty Years of Social Media on the Chinese Internet”. President of National Committee on U.S.-China Relations. “The National Committee is proud to partner with a wide range of institutions and community groups, including colleges and universities, world affairs councils, and trade and business associations to implement this program. The Committee would also like to thank its media partner SupChina for its help in promoting this year’s webcast. And of course, we thank our national webcast speaker, the Honorable Condoleezza Rice,” as well as our partners across the country, for sharing their insights. Light refreshments will be served after the event. The event is FREE to the public. This event is sponsored by the Confucius Institute , co-sponsored by the Department of Languages, Literatures & Culture, the Center for Global and Area Studies and the Asian Studies program.